It was a bitterly cold winter evening in February. I’d worked late. My head was aching and my eyes were burning from staring at financial reports all day. I had no idea what I was going to make for dinner and I didn’t feel like cooking. I took my dog for a walk and at exactly the halfway point – it started to rain. As we jogged home, a UPS truck drove past us, splashing us with puddle water. But when we made it home, there, on the porch, was a package. A package apparently left by that same UPS delivery truck. A package … from Amy’s Kitchen. Inside was a number of coupons and a variety of canned soups and chilies. Ideal food for a cold, wet winter night! Amy’s Kitchen, your timing was perfect! Of course, Amy’s Kitchen sent me the products and coupons for me to write product reviews, and those are certainly coming! But first I’d like to share a bit I learned about Amy’s Kitchen from reading the brochures. I mean, I’ve been veg forever now but this was still news to me. Amy’s Kitchen has a ton of vegan products – over 100 items. Maybe I didn’t realize that because I don’t often hang around in the prepared foods section of the supermarket. Or maybe it’s because Amy’s doesn’t ostentatiously label their food as “vegan” – just “dairy free.” Since all of Amy’s food is vegetarian and they don’t use eggs in any of their products, non-dairy equates to vegan. Amy’s Kitchen has many vegan items besides frozen dinners, burritos, and wraps. Amy’s Kitchen also has seven kinds of vegan veggie burgers, veggie meatballs, veggie sausage, pizzas, chili, baked and refried beans, pasta sauce, salsa, desserts and frozen desserts, plus a verrrry long list of soups. I had no idea! All of their ingredients are non-GMO. 99% of their beans, grains, and vegetables are certified organic. 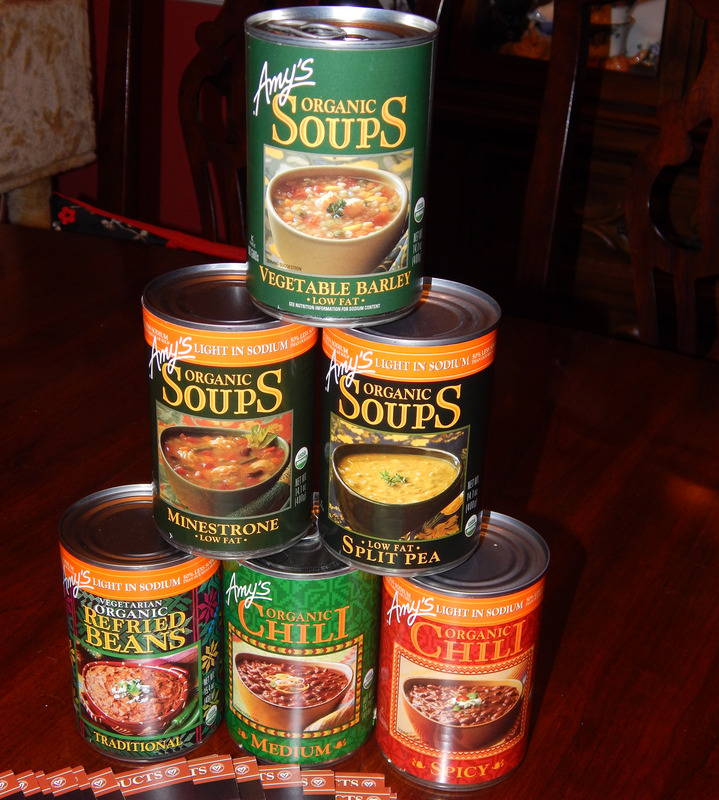 Cans (soups, chilies) have BPA-free liners. Product packaging is safe to microwave. The film around each frozen food tray (the overwrap) is made of polypropylene, which does not contain plasticizers. Trays are paper, lined with PET, which is also free of plasticizers. Burrito packages are made of PET, with an inner polyethylene film in contact with the burritos. Neither of these films contains plasticizers. Amy’s Kitchen is also a somewhat unique line because, unlike most “veg” food lines, very few of their products resemble meat. Instead, they focus on a wide variety of naturally meatless food, including Thai, Indian, and Mexican dishes. Perfect for those vegans (or vegetarians) that prefer not to eat anything resembling meat! Many of their vegan products are also gluten-free and/or reduced sodium. Frugal Friday will return, as I get back into the habit of blogging! In the meantime, here’s a frugal tip. Amy’s is very generous with coupons – even if you’re not a blogger, or maybe just a beginning blogger! First, go to the Amy’s Kitchen website and click on the Community tab, then click on Coupons on the drop-down menu. Sign up for their newsletter and follow them on Facebook. Please play fair, however. If Amy’s Kitchen (or any other company) is nice enough to send you coupons, please post a review on your blog, Facebook page, Twitter, or on Amy’s website. I do, too – the sauce is awesome. I’ve tried Amy’s lentil soup and it was fantastic! Low-sodium and vegan, it was perfect for college living 🙂 Wish I could get in on that deal to try out some of her products!! The lentil soup seems to be a big favorite and I can’t wait to try it! If you go to the Amy’s webpage under “Contact Us” you can send them a message under “Coupon Request.” I’m sure they’d send you some coupons! They were really a wonderful surprise that night! The ones I’ve tried so far have been great and I will probably start keeping a stock of them, too – just in case! Amy’s products look really great. You did a really good writeup. Thanks, Daddy! And guess what … they have a Thom Ka soup, like you had at Monsoon! I love their lentil soups, we probably have one once a week. And they’re hearty enough to feed two with one can! I haven’t tried their lentil soups yet but I’m looking forward to it! You’re right, jalapeno corn bread would go perfectly! I’ve seen this line of products but have never tried them. In fact, I’ve never even picked up one and read the ingredients. Thanks for the review. I’m loving that you mentioned they were low in sodium as I need to watch my sodium intake (hypertension) as well as my carb intake (pre-diabetic). Amy’s is impressive! We’ve been eating our way through a lot of Amy’s foods! I should have some individual product reviews up in the next week or two. Have you checked out pcrm.org? (Physican’s Committee for Responsible Medicine?) They have some good information about how diet affects hypertension and diabetes, and how a vegan diet can help. i left an original concern on pizzas our family bought on comments .no reply so I repeated it. yes I left an email address. both times no response. they don’t appear to like criticism. they don’t have an email address to try and get through. I’m sorry to hear that, Jody! What was your concern about the pizzas? Maybe I can help you get a response.